We’ve had a few days of weather reminding us that fall is approaching, and term has started already for Nathan, but the summer weather appears to be back for a few weeks now. 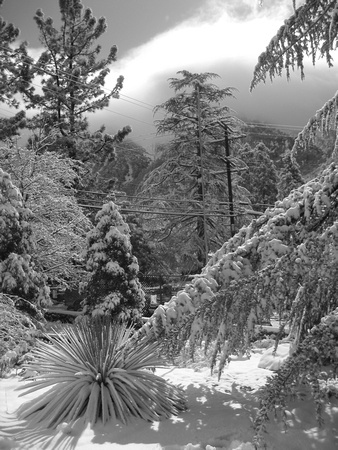 So, in honor of appreciating the last few weeks of summer, let’s talk about snow in LA, yes? This was another little last minute thing. 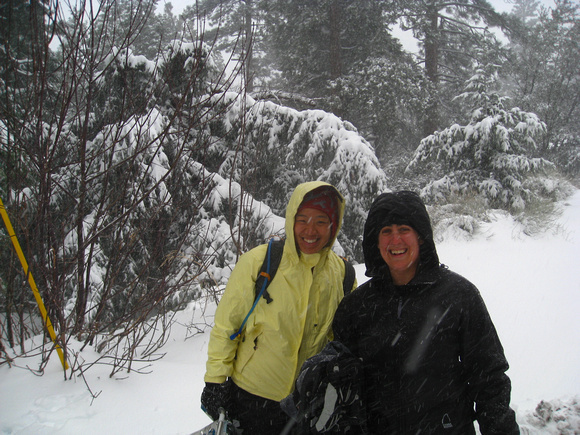 There had been a good storm, and Jenny rang me up and asked if I wanted to go for a quick snowshoe jaunt. 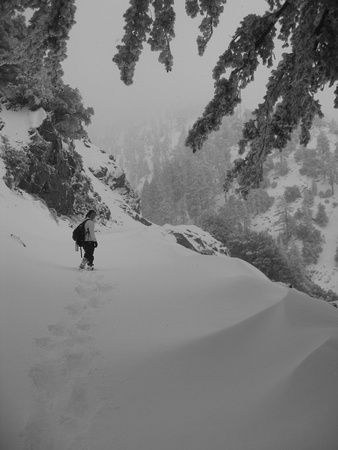 She didn’t really know so much of what was up near Baldy yet, and I knew a bit, but not so much more about this snow travel version of it, but I said heck, let’s go for it. I don’t think we ended up doing quite as much travel as maybe we could have, but overall I think we still got a really nice day and some awesome things to see out of it. As usual with trips heading up to wintry things in Southern California, the drive itself was begun in sunny and green landscape (it is the paradox of SoCal that the lower elevations are much greener in the winter than other times seasonably 🙂 But soon we started to see the hillsides around us dusted in snow. Then a bit more than dusted. Then verging into heavily covered. When we stopped at the visitor’s center to get our permit, I would in fact say that there was “a lot” of snow – involving even seeing all the yuccas all snow covered, which never ceases to entertain me. Shortly after that, we pulled over at the chain station, just before the road starts some of its real crazy up sections, and Jenny got to learn how to put on her new “quick, easy” chains, which of course, this being the first application, were neither quick, nor easy. However, neither were they overly difficult, and we proceeded onwards, quickly getting to Manker Flats parking where we stopped car travel, getting ready to continue with on foot. We started on up the fire road, and unlike some of my prior adventures up this way, we got to snow basically right away. 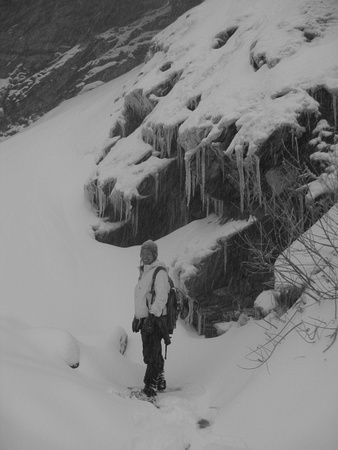 We had our snowshoes on well before the first turn in the road, by the waterfall. However, instead of continuing up, we ducked over and down, towards the waterfall, which was great fun, as I had never gone over and seen it up close before. 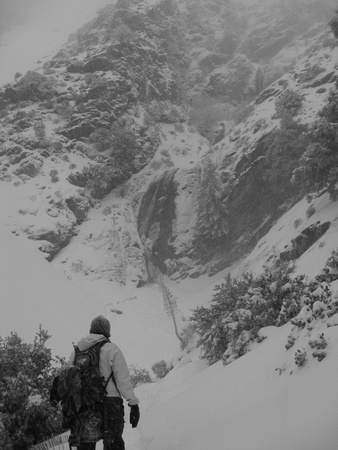 It was going pretty gangbusters, providing some great tumbling water and slush, then running under the snow all around us. 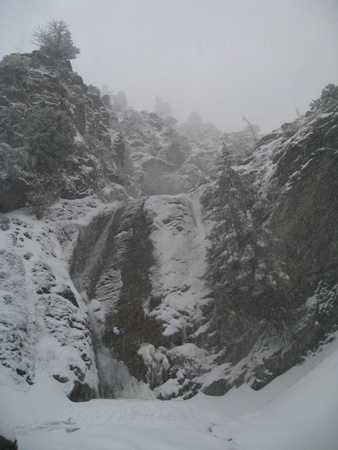 It’s only a small waterfall, but watching it tumble down in the middle of a snowy day in southern california was a pretty memorable experience, and some truly impressive icicles hanging around. After tramping around there a bit, we continued on up the fireroad, and for once, rather than turning up the side trail towards the ski hut, we stayed on the fire road. Total craziness.